We have a variety of models, brands and styles of dryers in stock. 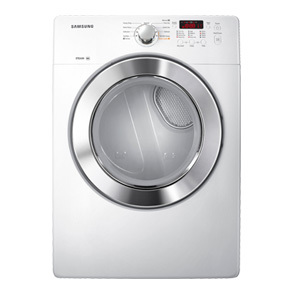 This 7.3 cubic foot Samsung Front Load Dryer is an example of the kind of dryers we carry. We have both gas dryers and electric dryers. Our inventory changes daily. If you are interested in new dryers, new scratch and dent dryers, new display model dryers or new open-box dryers call our St. Louis county store at 314-614-7434. If you are interested in used dryers call our used appliance store in St. Charles at 314-736-0852.